God would like a word with you. What you believe about God affects the way you approach life--often in ways you don't realize. Are you convinced that God limits you, or liberates you? Is he more interested in correcting you or connecting with you? And when you hit a rough spot and start looking for help, do you believe God is against you or on your side? 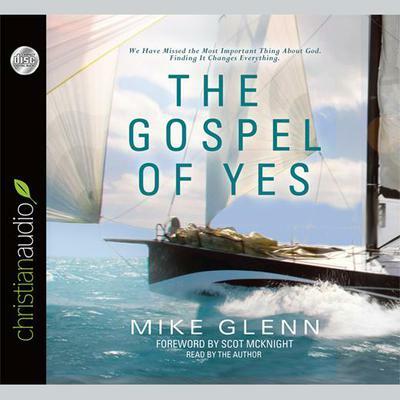 In The Gospel of Yes, Mike Glenn reveals God's most powerful word, which opens our eyes to everything he does. That word is YES. God said "yes" to creating a world for us to live in and "yes" to inviting us into a relationship with him. No matter what we face in life, the best way to live is captured in one word: yes. When you live in God's "yes" you find your identity, your true value, and your unique purpose on earth. You can stop trying to be someone else and enjoy being yourself as you join with God in doing the work of his kingdom. When God looks at you he always says "yes". It's time to live like you know it.